My paintings are also a testimony to the beauty and intelligence of pre-colonial societies and a tribute to how these societies were organised. The way in which I place these societies in relation to the present is rather like tracing a traditional and cultural knowledge that was crushed by the rise of industrial power. 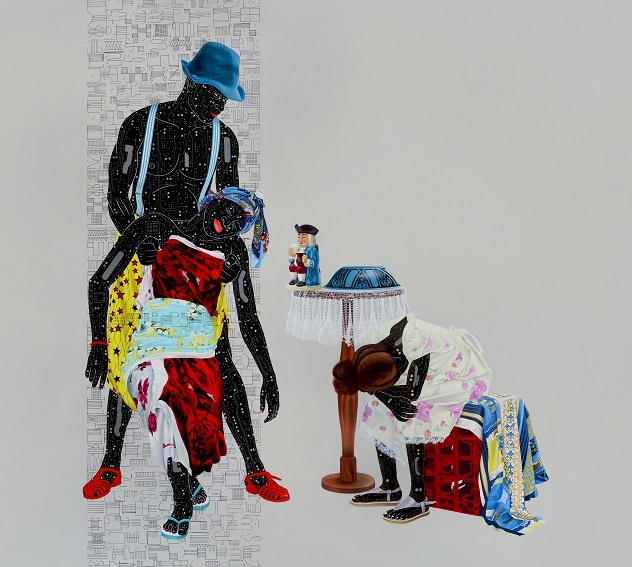 Until June 16 Eddy Kamuanga Ilunga’s work will feature at the October Gallery in London. For this exciting event, I was invited to attend the opening night where I learnt more about this emerging Congolese artist. 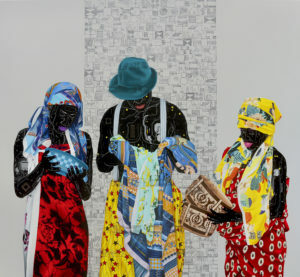 Upon arrival a crowd had gathered in the small central-London gallery, marking the launch of Eddy Kamuanga Ilunga’s first UK solo show Fragile Responsibility. The wine was flowing, the canapes circulating and I was ushered into the viewing space. 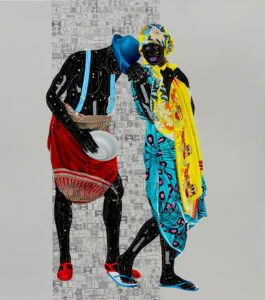 Over two rooms and across several walls hung Kamuanga Ilunga’s uniquely styled artwork, each piece its own world filled with symbols and ideograms. To truly appreciate the staging of his work, a little knowledge first had to be understood. Different they may seem with time but what will remain are the clever motifs that Fragile Responsibility repeats. In order to read these symbols correctly however, one must appreciate the social, political and economic context of the DRC. As a predominantly Christian country, native traditions have been side-lined and rejected from popular culture often vilified as ‘Pagan’ beliefs. Ironically this influence came from Catholic missionaries whose job was to ‘save’ natives by converting them into Christians, yet their influence is an intrinsic part of the indoctrination and suffering of the Congolese people. Another important fact is that the DRC is the world’s largest exporter of coltan, a metallic mineral used in computer processing and telephony. This is featured in Kamauanga Ilunga’s work; plastered across his figure’s skin, faces and body as a ubiquitous reminder of this trade economy. The idea of fusing the current with the stylised was perhaps implanted in Kamuanga Ilunga from an early age. Inspired by other artists Eddy recalls “When I was five years old on my way home from school, I would always see a group of artists who would reproduce American cinema posters in oil paintings on large format paper. Whenever I saw those posters I felt a connection, something that I could finally hang on to. So I started trying to reproduce posters, comics, everyday objects and images from advertising on the street. It helped me understand something else, another form.” The circuitry that replaces his figures’ skin confirms this cultural context in the same way, making the artwork a reference to popular culture and contemporary mores alongside traditional aesthetics. 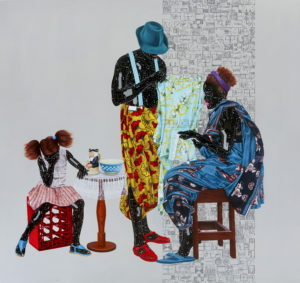 In this UK solo exhibition Kamuanga Ilunga indeed examines Congolese history, colonialism and its effect on contemporary society and identity. Walking through the gallery and examining the bold pictures hanging on the walls, I can clearly see the notable objects such Toby Jugs or porcelain decorations used as leverage by the Portuguese. These factor into the overall meaning of the portraits by bringing slavery and its baggage into the forefront of interpretation. Indeed Eddy himself says he delved into this history deeper to observe its heritage to slavery. The 17th and 18th century in particular holds importance as this was when such trade, coercion and bribery persuaded African leaders and kings to sell their own people into slavery. 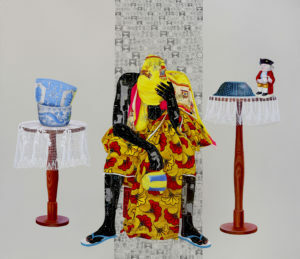 The above piece entitled Fragile 1 shows a woman sitting with her head in her hand, in a position of distress or defeat. She is surrounded by the Toby jug and other bowls. Draped in tradition African print she is a typical Congolese woman yet the circuitry on her skin and the artefacts create a motif. The tradition of exploiting black people extends from the slave trade to present day with the export of coltan out of the land. “They refer to the violent exploitation…in the Democratic Republic of the Congo. This illustrates my attempt to assume personal responsibility (by raising awareness, awakening others). 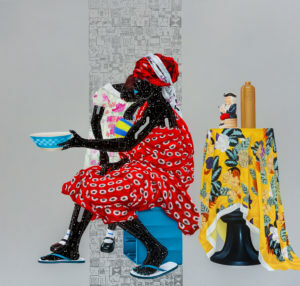 By exposing the lack of responsibility in our leaders who are complicit with the West, I try to interrogate the utopia of a social-democratic state and expose the threat of losing the historical roots that are crucial lines of thought, essential to each individual.” The picture is made up of contrasts; for example her black skin stands out against the light porcelain, the Toby jug rests steadily on the side table whilst the figure slumps in her chair. There is fragility but not from the delicate object but rather the people themselves. After my visit to the October Gallery I was not uncomfortable but left feeling fragile – perhaps unsurprising given the theme – I was unsettled by the reminder that human life can be so easily commodified. 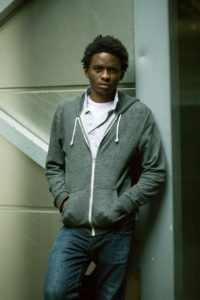 However with this came a better understanding of what it means to be truly strong: if Eddy Kamaunga Illunga’s artwork teaches us anything, it is to learn from our past in order to free ourselves in the future, and that standing in the face of difficulties is more than just rebellion; it is true strength.